Mutants are weak vs. harpoon cannons. Fallout 4's Far Harbor expansion adds a large new zone set in post-apocalyptic Maine. 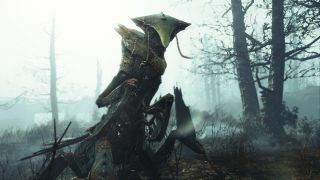 You're on a mission from Valentine's Detective Agency to find a missing person, but Far Harbor's old fishing villages have become flashpoints in a faction war, and the swamps have become breeding grounds for some ugly new creatures. It looks a lot like a more detailed take on Fallout 3's Maryland-set Point Lookout DLC, though that didn't feature a giant harpoon cannon or a suit of military armour that makes you look like a mud-spattered Master Chief. Far Harbor is out tomorrow, Thursday May 19, but Kotaku report that some players have already tried it after aclosed beta tester seemingly uploaded the DLC to the Fallout 4 Nexus modding site. It was swiftly taken down, but not before plot details made their way onto the web. If you're planning to download it tomorrow, beware of spoilers.